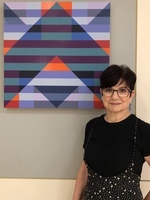 Karen Freedman is recognized for her vibrant abstract geometric paintings that explore the interaction of color and its ability to alter perception. She began her formal art training studying jewelry design at The University of the Arts in Philadelphia and graphic design at the Tyler School of Art. Ms. Freedman then went on to build a successful graphic design business followed by her immersion in the fine arts. Ms. Freedman has exhibited both locally and nationally at venues that include Cape Cod Museum of Art, Endicott College, Hunterdon Art Museum, The Gallery at Penn State Great Valley, The State Museum of Pennsylvania, Art Center Sarasota, Kimball Art Center, and the George Segal Gallery, Montclair State University. Her paintings are included in the permanent collections at Temple University’s Howard Gittis Student Center and the Park Towne Place Premier Apartments both in Philadelphia. Ms Freedman’s work is featured in the books Encaustic With a Textile Sensibilityby Daniella Woolf,Encaustic Art (Art of the Century)by Jennifer Margell, and Encaustic Art in the Twenty-First Centuryby Anne Lee & E. Ashley Rooney, as well as numerous exhibition catalogs.